What with the film world abuzz with the word “Oscars” at the moment, I decided to revist last years’ main contenders for the top prizes. With eventual victor “No Country for Old Men” out of the way, it’s the turn of “There Will Be Blood” to get watched, reviewed and then archived. Woo! Let it never be said that I only review brainless films. Looking around, I realise that a pinch of “Slumdog Squarepants” here and a dash of “No Country for Old, Sardonic, World-Weary Men” there isn’t doing much to bring up the average I.Q. of the reviews on display. 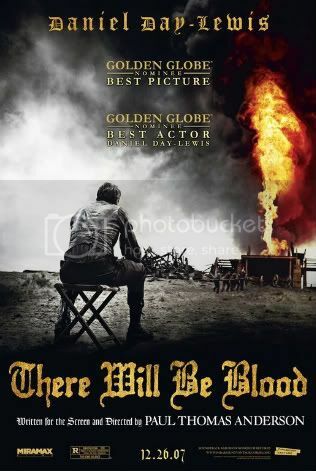 So in an effort to change that, let’s look at “There Will Be Blood” or, as I constantly mistype it, “There Will Be Bloof”. Daniel Plainview (Daniel Day-Lewis) is a silver prospector-turned-oil man, working his way from a single-man dig to mini-mogul status. On a tip from Paul Sunday (Paul Dano), he travels to a small town in search of the ol’ black gold, with his adoptive son H. W. (Dillon Freasier) in tow. But there, Eli Sunday (also Dano), Paul’s twin, throws roadblocks in his path. The story’s very interesting and keeps you hooked throughout. On one hand it’s about human greed and religion and on the other, it could be a political point about the war on Iraq. However you interpret it, it’s a fine piece of cinema. It’s no secret that Day-Lewis won the Best Actor Oscar for his role as Plainview and deservedly so in my opinion. You can tell he really throws himself into the parts he takes as Plainview is somehow likable amidt the increasingly crazy and horrid things he does. Dano is also to be commended as he shows that he’s more than just the silent, Nietzsche idolising, wannabe pilot from “Little Miss Sunshine”. He plays the infuriating Eli with great skill and made me want to reach into the screen and choke him (which I’m sure was the intention). I was a bit sceptical when the film opened with a dialogue-free 20 minutes or so where Plainview is (painfully) digging and blasting for silver. It’s not that it’s not a good and powerful opening- but nothing says “art film” than a scene like this. For once, I’d like to see a film which has an exciting car chase, some explosions and the like, all to a heavy rock soundtrack go on to win big at the Oscars. Surely if the film is good, it doesn’t really matter about the typical action orientated context. Why can’t it happen? Oh yeah, because the Academy are pretentious bastards who will ignore a fantastic film for Best Picture *cough*The Dark Knight*cough* in favour of a lesser, more awards-pandering film *cough* Benjamin Button *cough*. Fuckshovels the lot of ’em. Anyway, my point was that it’s quite a conventional opening for this type of film. The one thing that permeates the above scene and the rest of the film is Jonny “I’m in Radiohead” Greenwood ‘s daring, sparse and unsettling score. It’s fantastic when coupled with the amazing cinematography on display here. When together, they produce an effect that reinstills my mostly fleeting belief that film is still a form of art. (Still think it is? Check out this and once you’ve finished crying and vomiting, come back to me) I know I sound like a snooty tossbag, but this film is genuinely amazing. Oh- and Greenwood not getting the Oscar for his awesome score? A travesty if ever there was one. “There Will Be Blood” is not really the sort of film where you can have a favourite scene, but regardless I do have one. The ending. Much like with “No Country For Old Men”, I didn’t really agree with the ending. It took a repeat viewing to realise that, once again I was wrong and P.T. Anderson was right. I can still see why I didn’t agree with it first time around. First off, it’s really jarring when compared to the achingly slow tension building and growing insanity of Plainview. Secondly, some of it struck me as quite comedic at times. However, I remembered that comedy and tragedy are closer than people want to admit and now the scene scares the crap out of me. Whilst I prefer “No Country…” in terms of a film to watch, “There Will Be Blood” is definitely an experience you should partake in. It’ll blow your mind.